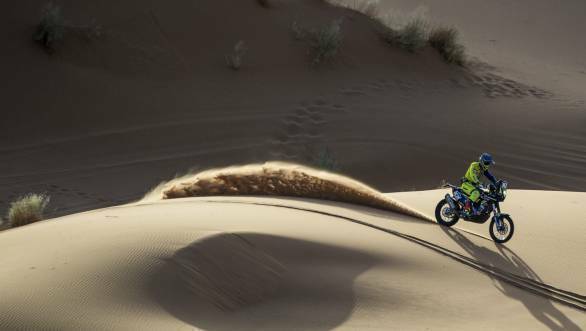 The first half of the marathon stage, Stage 3 of the 2018 Merzouga Rally, went well for the Indian contingent at the event - comprising the Sherco TVS Factory Rally Team and Hero MotoSports Team Rally. Over in the Sherco TVS camp, it was Joan Pedrero Garcia who continued to lead the way. The Spaniard finished eighth in the stage, which allowed him to classify eighth overall at the end of three legs. His team-mate Lorenzo Santolino finished the stage in eleventh place, which ensures that he is now ranked ninth overall. Martin Diego Duplessis finished 13th in the stage, while Vanni Cominotto finished 21st in the stage. This means that Duplessis is currently ranked 11th overall, while Cominotto is ranked 24th overall. 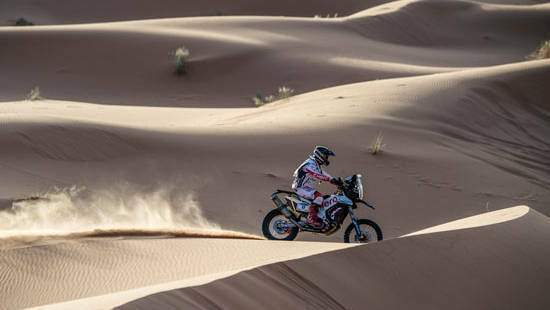 Pedrero seemed pleased with his performance, saying, "This stage was extremely challenging for me as I had to negotiate dunes, sand and stones in a special marathon stage. We had to cross the tricky stone terrain with care as there was no external help in this stage. I am glad to have finished it with my bike in a good condition." 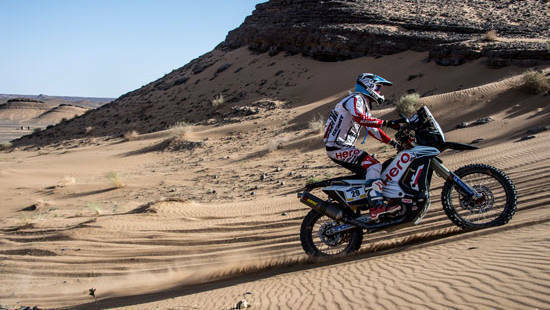 The Hero MotoSports Team Rally riders Oriol Mena and CS Santosh were able to move past the minor setback in Stage 2 and continue to climb the order. Oriol Mena finished the stage 14th while CS Santosh finished the stage 26th. This puts them 16th and 20th respectively in the overall standings. Speaking after the first half of the marathon stage was done, Oriol Mena, said, "I started well today and attacked from the start to catch the rider in front of me. It was a day of mostly solo riding as I had a good clearance both in front and behind me. Made no navigation mistakes and rode carefully in the rocky section to arrive safely at the Marathon Bivouac. Now we rest and then prepare for the next section of the marathon stage." Meanwhile Santosh said, "Today I decided to keep it safe with an aim to get the bike to the Marathon bivouac. My navigation was good and made no major mistakes, so a steady stage for me. The dune section was quite smooth and the rest of the part had lot of rocks and stones so I had to be careful there. The bike is riding perfectly and I am looking forward to the second part." Stage 4 will see the riders negotiate another 233 km of special stage slotted in between 36 km and 103 km of liaison sections. The riders will then reunite with their assistance crew at the Tombouctou hotel with only the last stage remaining to decide the rally champion.